To learn the meaning of Pancreatica, let’s take a historical look at the language and medical terminology of the pancreas. Although the largest pancreatic artery which supplies nutrient to the main pancreatic duct is now referred to as the great (or greater) pancreatic artery, this structure has historically been known as the arteria pancreatica magna. 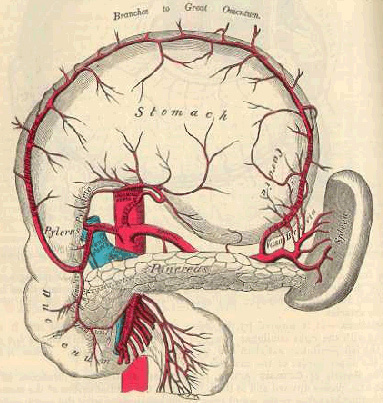 In discussing this artery, Henry Gray in his first English edition of ANATOMY — The Anatomic Basis of Medicine and Surgery (J.W. Parker and Son, London, 1858) reports, “One of these, larger than the rest, is given off from the splenic (artery) near the left extremity of the pancreas; it runs from left to right near the posterior surface of the gland, following the course of the pancreatic duct, and is called the pancreatica magna.” In the Latin language, pancreatica is the feminine for the English word: pancreatic. (And pancreatico is the masculine for the English word: pancreatic). Pancreatica has the same Latin meaning and gender-divisions in the modern day languages of Italian, Spanish and Portuguese. We appreciate the sound and metre of the word, and enjoy its resonance and symbolism. It is our hope that this website will act as a vessel for the delivery of accurate and timely information to those in need.